If your facility has unwanted vehicles, graffiti problems, or even neighborhood kids causing chaos, you might be interested in random patrol checks by a security guard in a marked patrol car. One of Citiguard’s security protection consultants will be happy to sit with you, listen and discuss the problems and make a preventative plan to help. Citiguard will send a security guard to your location in a marked vehicle and walk the premises and take an accurate log of all suspicious activities. 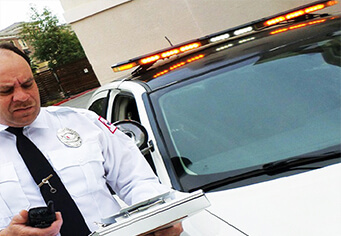 If a problem arises our security guard will make every attempt possible to resolve the problem before having to contact law enforcement and/or the property manager. Regardless of the outcome, our security guard will write a detailed report and submit it to our client within 24 hours. By having a marked patrol vehicle that makes frequent and random stops at your facility, it will act as a deterrent which will likely prevent most illegal activities from happening because they won’t know when the next patrol check will be. If during a patrol check our security guard notices suspicious activity, he/she will take pictures and we will email them to our client so they will have record of the activity and/or the individual(s) for their records. If the problems continue, our security protection consultants will discuss with you the possibility of an on-site security guard from Citiguard. While our marked vehicle Security Guards Ventura Ca or other many cities visit your facility, he/she will do a walk through to ensure the safety and security of your tenants, guests and your facility.